Pandya shines in Mumbai's win. Image - BCCI/SPORTZPICS. 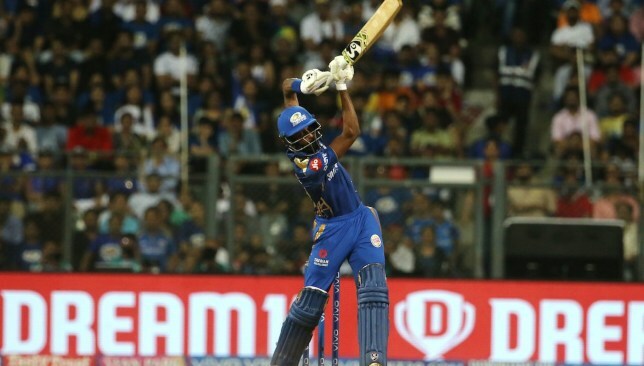 Mumbai Indians skipper Rohit Sharma has lauded Hardik Pandya for yet another excellent match-winning contribution in the Indian Premier League (IPL). Pandya struck an unbeaten 37 off just sixteen deliveries after picking up a wicket with the ball earlier to lead Mumbai to a five-wicket win over Royal Challengers Bangalore in Mumbai on Monday. The right-hander struck 22 runs off the penultimate over bowled by Pawan Negi to set up the fifth win of the season for Mumbai. 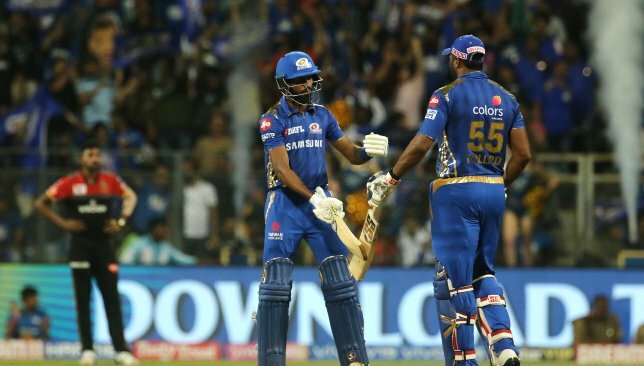 It was the continuation of what it turning out to be an excellent IPL 2019 campaign with the bat for Pandya and the all-rounder’s importance to the squad was not lost on skipper Rohit. It had been a difficult past year or so for Pandya at the international level with injuries and controversies seeing him sidelined for a lengthy spell. The all-rounder has now scored 186 runs in the ongoing IPL campaign at an average of nearly 47 along with a strike-rate of over 191. “Yeah, he (Hardik Pandya) has been at a different level,” an elated Rohit said after Mumbai’s fifth win of the season. “He wanted to contribute with bat and ball in this particular season. He didn’t have much cricket before IPL so he wanted to prove a point, to himself more than anyone else. Rohit also hailed the impact of Lasith Malinga who picked up 4-31 with the ball on his return to the Mumbai playing XI. The veteran Sri Lanka pacer had missed the last three clashes but he came back all guns firing with an exceptional display, especially in the death overs to help restrict RCB to just 171-7. “I’ve been talking about him more often, how he’s been an important member of this squad. His performance matters to us. Now he’s back from Sri Lanka with that sort of performance. It will help us moving forward because his form is very critical,” said Rohit. “Trust me, bowling at Wankhede in the death overs is not easy. He held his nerve against one of the best in the world,” he added. 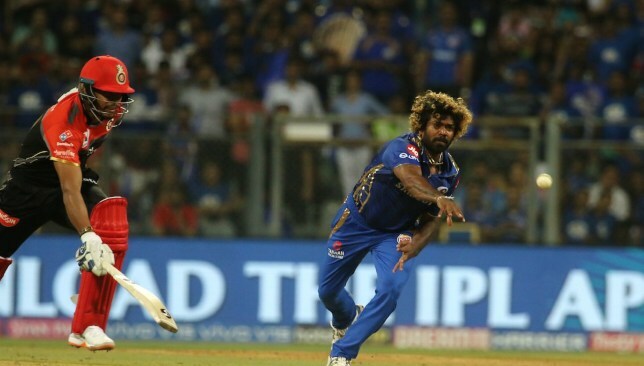 Malinga himself was delighted to get back into the thick of things after having to juggle between his Sri Lankan domestic cricket and IPL commitments. “Last couple of weeks have been a tough time for me, I had to go to Sri Lanka and play the domestic tournament. But I realised that when I get a chance, I have to give 100 per cent,” said Malinga after being awarded with the man-of-the-match award. A match-winning cameo from Pandya. Image - @IPL/Twitter. Mumbai Indians got their 2019 Indian Premier League (IPL) campaign back on track with a five-wicket win over Royal Challengers Bangalore at the Wankhede Stadium. Chasing 172 runs for victory, Mumbai survived a few nervy moments before coasting home with six balls to spare. Having seen their winning streak brought to a halt by Rajasthan Royals, Mumbai bounced back to third spot in the league table with their fifth victory in eight games. All-rounder Hardik Pandya steered Mumbai home with a 16-ball 37 that included five fours and two sixes. For Virat Kohli and his men, it was the seventh defeat in eight matches with the side remaining rooted to the bottom spot in the standings. 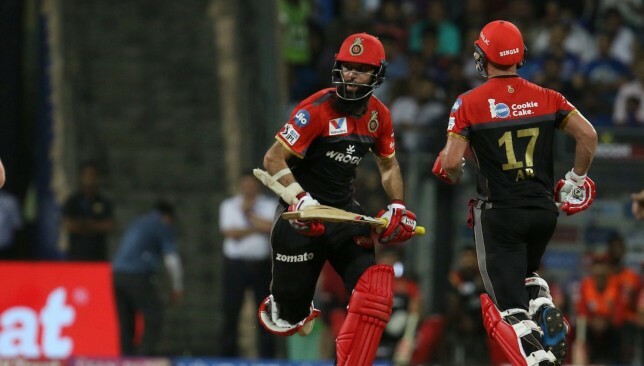 Having been made to bat first by Rohit Sharma, RCB struggled in the early half of their innings with skipper Virat Kohli failing to last long. Parthiv Patel played a brief entertaining cameo but Bangalore were tottering at 70-2 at the half-way mark. Thankfully for the visitors, AB de Villiers came good after a scratchy start with the South African slamming his fourth fifty of the campaign and the second in succession. He found excellent support in Moeen Ali who brought up only his second IPL half-century. The pair added 95 runs for the third wicket to put the visitors in an excellent position before the death overs approached. A fine stand between ABD and Moeen. Image – @IPL/Twitter. While Australian pacer Jason Behrendorrf had an expensive outing, Mumbai hit back in the death overs with Lasith Malinga coming to the fore. The veteran pacer was making only his fourth appearance of IPL 2019 and wasted no time in reminding batsmen of his prowess with a four-wicket haul. Bangalore were batting at 144-3 at the start of the 17th over bowled by Malinga with both Moeen and ABD going great guns. The Sri Lanka man outfoxed Moeen with a slower delivery with the wicket taking the sting out of RCB’s attack before dismissing Marcus Stoinis for a duck in the same over. Malinga bagged another couple of wickets in the final over with his slower delivery proving hard to read. His excellence at the death, along with Jasprit Bumrah’s, saw Mumbai restrict the visitors to an under par score and that proved to be the difference. An excellent comeback from Malinga. Image – @IPL/Twitter. The hosts got off to a flyer in their chase of 172 with openers Quinton de Kock and Rohit Sharma adding 69 runs inside the powerplay overs. From there on, it looked like Mumbai would canter towards a comfortable win but the introduction of spin changed the complexion of the game. With the ball gripping and turning prodigiously, RCB’s spinners came to the fore in the middle overs. Moeen Ali backed up his batting efforts with the wickets of both Mumbai openers in his first over before Yuzvendra Chahal removed Suryakumar Yadav and Ishan Kishan in quick succession. The two spinners conceded only 45 runs between them in eight overs and shared four wickets to set up a tense finish. However, spin proved to be RCB’s undoing in the end with Hardik Pandya smashing 22 runs off the penultimate over bowled by Pawan Negi to take Mumbai home with an over to spare. Buttler v Ashwin round two. Image - BCCI/SPORTZPICS. 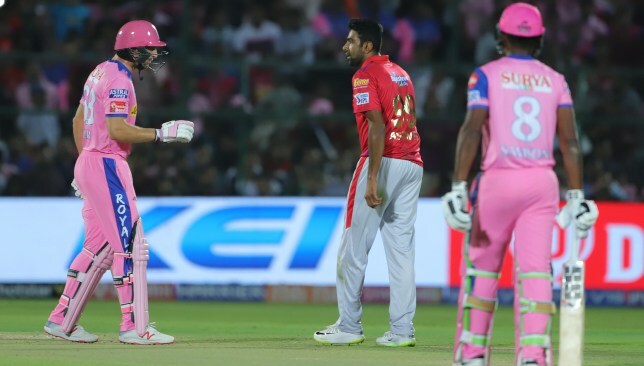 After an excellent start to their 2019 Indian Premier League (IPL) campaign, Kings XI Punjab have hit a snag as Ravi Ashwin and his men prepare for the visit of Rajasthan Royals to Mohali on Tuesday. KXIP’s crushing eight-wicket loss to Royal Challengers Bangalore on Saturday was the fist time that Ashwin’s men had been beaten at Mohali this season in four attempts. It was also the third loss for the franchise in four games and it has seen them drop out of the top-four and play-off spots. The meeting between the two sides sees Ashwin square up against Jos Buttler once again after running him out controversially via the ‘Mankad’ in the reverse fixture at Jaipur. The England batsman’s dismissal for 69 proved to be the turning point of that clash with Rajasthan collapsing dramatically in their chase of 185 to go down by 14 runs. The animosity from that match might spill into Tuesday’s clash and there is no doubt the visitors will be gunning for revenge. While KXIP have now dropped down the table, the battle for the play-off spots is already turning into a nail-biting affair with just over half the fixtures already completed. Defending champions CSK are the run-away leaders with 14 points but there is little to choose between the next five teams. It is an intense race which even the Royals will be hoping to enter with a victory on Tuesday after registering just the second win of their campaign on Saturday against Mumbai Indians. Ajinkya Rahane’s men had been in almost a similar position at the same stage in 2018 before they pulled off a five-match winning streak to sneak into the play-offs. If the Royals are to still make a late run into the final four, they will need an encore from Jos Buttler who registered five fifties on the trot last season to lead the charge to the play-offs. The Englishman is already starting to rediscover that sensational form and looked in pristine touch in the victory over Mumbai where he struck a 43-ball 89. While Buttler has chipped in with three fifties already, the rest of the overseas contingent bar Jofra Archer has been a huge letdown. Rajasthan almost threw away the game against Mumbai post Buttler’s late dismissal and Rahane did not hide his disgust at yet another collapse despite the win. Two of their players – Jaydev Unadkat and Ben Stokes – feature in the five most expensive bowlers list and it is no wonder they have struggled. Rajasthan will need other candidates to rally around Buttler if they are to pick up their form since the Englishman will depart soon for England’s World Cup preparations. Rajasthan were missing Ben Stokes in the win over Mumbai with the England all-rounder ruled out due to injury. With his replacement Liam Livingstone having a dismal outing, the Royals might be tempted to bring in Ashton Turner should Stokes fail to recover for the clash. For KXIP, Ashwin could reinstate South African pacer Hardus Viljoen into the playing XI instead of Andrew Tye provided he has recovered from the illness which kept him out of the loss to RCB. Kings XI Punjab: KL Rahul, Chris Gayle, Mayank Agarwal, Mandeep Singh, Sarfaraz Khan, Nicholas Pooran (wk), Sam Curran, Ravi Ashwin (c), Andrew Tye/Hardus Viljoen, Mohammed Shami, Murugan Ashwin. Rajasthan Royals: Ajinkya Rahane (c), Jos Buttler (wk), Sanju Samson, Steve Smith, Rahul Tripathi, Ben Stokes/Ashton Turner, Shreyas Gopal, Krishnappa Gowtham, Jofra Archer, Dhawal Kulkarni, Riyan Parag.